The UNCG Disc Golf Club sponsors Saturday Singles out at Barber Park. UNCG club members are encouraged to attend these meetings, but they are also open to the general public. Tags are sold at all meetings for $5, and the round starts promptly at 11:00 am. We are now instigating a $3 buy-in! We hope this will encourage more university and community involvement. We will have multiple divisions with enough participants. Payout will either be cash for the time being. We will be starting the ace pool this coming weekend as well. Pitch in an extra $1 and if you hit an ace, you get the pot! Hope to see you on the course. 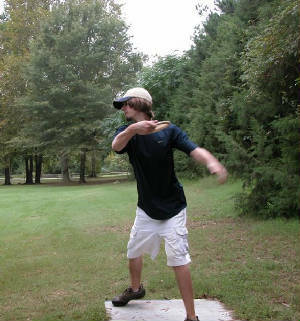 The UNCG Disc Golf Club is one of the newest club sports at the University, founded last Spring. Our primary goals are to promote the sport of disc golf as an enjoyable recreational activity and provide a setting for competitive play. We currently meet on Saturday mornings at 11:00 am at Barber Park. The course is rather long, so we are in the process of designing some short pads. Hopefully they will be installed by the end of the semester. Bag tags are now on sale, they are $5. 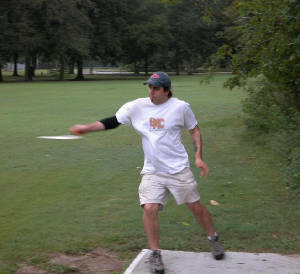 We are also working on placing a large disc order to provide prizes for top teams/individuals at the Saturday meetings. Once they arrive, there will be a small buy in ($3-4) to help cover their cost. If you are interested in joining the club, there are three forms you will need to fill out. You can find them in the links section of this site. Once you have filled out these forms, send us an e-mail, and we can submit them. Currently there are no member fees, so join while the going's good! If you are interested in viewing our constitution, click the link below.